Waypoint Robotics has launched the MAV3K (pronounced May-vick) industrial grade autonomous mobile robot (AMR). It has a 3000lb carrying capacity and omnidirectional mobility. MAV3K comes equipped with Waypoint’s Dispatcher software, allowing it to be set up and autonomously operating in under 15 minutes. MAV3K’s batteries keep it moving through the longest workday and Waypoint’s EnZone wireless charging system enables MAV3K to charge itself. 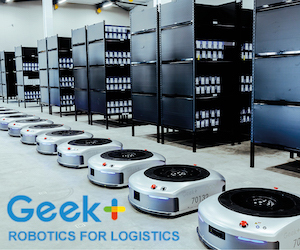 RG Group has become the first US company to agree on a distribution and integration partnership for Doosan’s collaborative robots. Doosan Robotics says its collaborative robots can be useful in different industries and processes ranging from assembly and inspection to gluing and packaging. 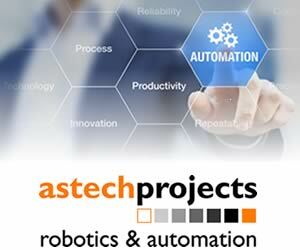 Kistler is planning to demonstrate its comprehensive measurement chain for press-fit and joining processes including force sensors, light barriers, maXYmos monitoring units and robotics application at the Automate Show 2019 in Chicago, Illinois, from April 8-11, 2019 at booth 9354. The increasing network of machines and systems driven by Industry 4.0 calls for efficient and flexible industrial manufacturing solutions. Individual production processes have to be optimized consistently and continuously to remain competitive in the long run. Artificial intelligence and robotics result in a powerful combination when it comes to automating tasks both inside and outside the factory setting. Artificial intelligence is becoming more and more present in recent years in robotic solutions, thus introducing learning capabilities and flexibility in what were consider rigid applications. Qualcomm Technologies has launched its Qualcomm Robotics RB3 Platform – the chipmaker’s first integrated, comprehensive offering designed specifically for robotics.